Some sixteen years before East Great Falls High student (and Ian Bell lookalike) Chuck Sherman was sent back in time to change the future for one lucky lady, a heavily accented Austrian bodybuilder made an even greater impact on the world of cinema. I'm sure the plot to the movie is familiar to most people (even if they haven't seen the film), but just in case you don't know, it involves a killer cyborg (Scharzenegger) sent back to the year 1984 from an apocolyptic future in which computers have overthrown the human race. His mission is to kill Sarah Connor (Linda Hamilton), who will one day give birth to the leader of Earth's resistance against the machines. Fortunately for her, the human resistance sends one of their own soldiers (Michael Biehn) to protect her. 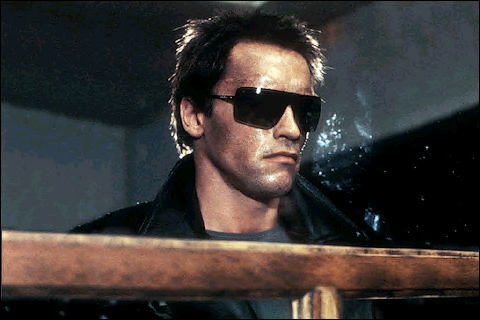 Looking back, it seems crazy that a guy with Arnie's limited acting abilities could become such a huge star, but the first two Terminator movies are great examples of a director making the most of Schwarzenegger's plus points (a natural screen presence and impressive physique), and using him in a role where his robotic line delivery is a perfect fit. Although a few of the special effects look a bit hokey now (particularly the way in which the Terminator moves in the final sequence) and the music is a little dated, Hamilton and Biehn are convincing in their central roles and there are a number of excellent action set pieces - particularly the scene in which the Terminator singlehandedly wipes out an entire police station. For my money, the sequel is the better film, this is nevertheless a highly entertaining mix of action and science fiction. This film sees Steve Carell reprise a similar character to the one he memorably protrayed in The Forty Year Old Virgin; this time he plays a set in his ways family man who is stunned when his wife (Julianne Moore) announces that she wants a divorce. 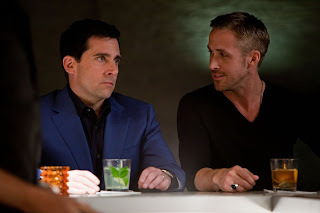 While nursing his sorrows at a local singles bar, he meets a slick ladies man (Ryan Gosling) who offers to school him in the ways of lovin' (rather like regular Onion columnist Smoove B). Meanwhile, other members of his family and friends are suffering from romantic travails of their own; his son has taken a shine to his seventeen year old babysitter, who in turn has a crush on Carell. It's all a little like the J Geils Band song 'Love Stinks'. After a promising opening three quarters, with a number of funny scenes (usually those featuring Carell's forays into the world of one night stands), the film is marred by a rather cliched, sentimental ending in which Carell and his on screen son are moved to get in front of a graduating middle school class and deliver a pair of soppy speeches about finding your soul mate. Still, Crazy, Stupid, Love is an amusing romantic comedy which for the most part exceeds its limitations due to a very strong cast. Before there was Halloween, and well before Friday the 13th, My Bloody Valentine and the many other holiday themed slasher movies, there was Black Christmas. Bob Clark's early '70s classic is set in a big, creepy sorority house during the Christmas holidays; the opening credits sees an unseen psycho take up residence in the attic of the house and during the course of the film he progresses from making sick prank phone calls to killing its inhabitants. The movie introduces a number of the elements which became ubiquitous to the genre - a deranged killer making sinister phone calls, shots from the killer's POV, and the murders of a series of attractive young women. However, Black Christmas also brings some important elements into the equation which some of its lesser imitators didn't pick up on. For one thing, the police in this film are, for the most part, pretty competent, realising early on that something is amiss at the sorority house and doing their best to protect the sorority sisters - tapping the house phone, putting a man outside the house and acting as quickly as they can to get to the scene of the crime when it is apparent that something terrible has happened. For another, the film is much more interested in generating suspense and tension than in simply showing off gory effects. When the killings do take place, they are filmed in a chilling and scary way, but the camera doesn't linger for long on the victim post mortem. For me, the scariest aspect of the film are the phone calls made by the killer. He gurgles, screams, shouts obscenities and makes enigmatic comments which appear to relate to his childhood and involve 'Billy and Agnes'. As the killer's identity and motive is never revealed, we can only guess the events to which he is referring, which makes it all more terrifying. Other than Halloween, this is as good as slasher movies get. 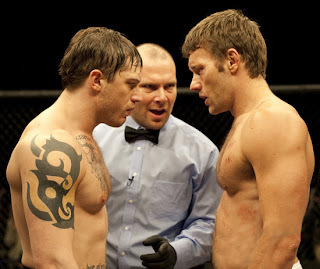 Tom Hardy and Joel Edgerton go head to head in a high prized mixed martial arts tournament in this movie, which is kind of like Rocky for UFC fans. The pair star as brothers who are both dealing with the emotional scars of growing up with an alcoholic father (Nick Nolte). Tom Hardy plays his character, Tommy, as a hulking ball of rage, resentment and hurt. He has recently gone AWOL from the marine corps and is trying to win the $5 million so that he can fulfil a promise to look after his best friend's wife. Joel Edgerton is Brendan, who is the more steady of the pair and is a family man, working as a physics teacher. However, he is even more in need of the money than his brother as the bank is threatening to foreclose on his mortgage and leave his wife and kids out on the streets. Working in its favour is that the film has two protagonists - all too often in this genre it is abundantly clear that the hero will win the day at the end of the movie, but in this case, we'e left guessing as to who will emerge victorious. On the other hand, a number of the other elements from the film seem to be recycled from other, generally better, underdog sports movies. For example, the story of an unknown who comes from nowhere to challenge for a major title is very reminiscent of Rocky I, while the hulking Russian opponent seems to have been lifted from Rocky IV. The fighting sequences are initially exhilarating, but lose their impact towards the end of the film when it becomes apparent that all of Tommy's fights end in a quick knockout, while in each of Brendan's bouts, he initially takes a beating before getting his opponent in a submission hold. Overall, then, it's fairly entertaining, but a little too derivative of other movies to score too highly.